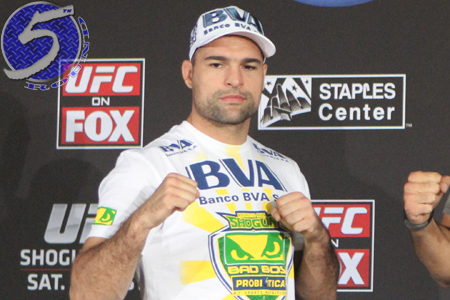 Kenny Rogers famously sang, “You’ve got to know when to hold ‘em – Know when to fold ‘em – Know when to walk away – Know when to run.” Well, former UFC light heavyweight champion Mauricio “Shogun” Rua (pictured) is gonna hold ’em. He’s not gonna walk away and he sure ain’t running into retirement. Many MMA pundits (and countless keyboard warriors) believe it’s time for Rua to call it quits after Saturday’s 34 second knockout loss to Ovince St. Preux. The Brazilian was TKO by Dan Henderson before that. Rua has dropped four of his last five fights and hasn’t won two straight since beating Chuck Liddell in April 2009. That was 12 long bouts ago. Nonetheless, Rua’s days inside the cage aren’t over yet. He will coach opposite Anderson Silva on the next Brazilian installment of “The Ultimate Fighter,” the two icons will not face each other when filming wraps, and after that he’s considering a move to the middleweight division. At 32, Rua is technically hovering around his prime. However, who knows how many years were taken off his career with his epic brawls in Pride FC and his two UFC instant classics with Dan Henderson. “I want to have my thanks registered here for all the support on my fight Saturday Night. I want to also thank you guys for all the showings of care and support after the fight. Losing is always very bad, hurts a lot, but what’s hurting more is to lose without being able to show what I trained, and what I know. Fighting is fighting, and I know very well that in this weight class any punch that connects early on can cost a huge price. For many times in my career I was in the happy side and unfortunately this time I faced the sad side of this story. I know a lot of people will unload harsh words, some will make constructive criticism and others will take the chance to throw all sorts of jokes and offensive words as possible. Unfortunately this is all part of being in the spotlight, and it’s something that we as professional athletes, and mostly in Brazil, have to be always used to deal with.